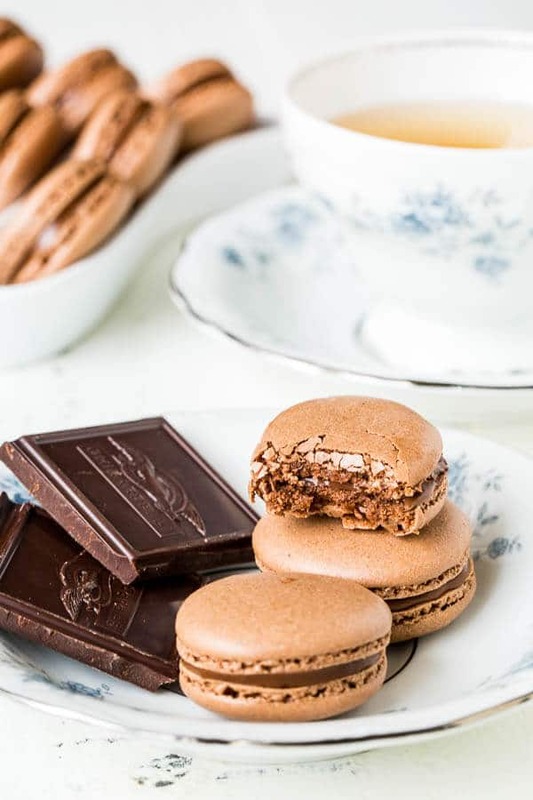 Ultimate chocolate macarons filled with silky smooth chocolate ganache. Simply the best! 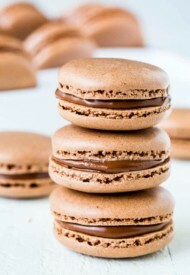 For some odd reason, chocolate macarons have been the biggest challenge for me. It took me numerous trials to create a recipe that worked for me beautifully at the time. I even re-tested like 4 times just to be sure. My first trial ended with these beauties, followed by another 5 batches. My freezer was bursting with frozen macarons, not all of them in their prime shape, but they all taste delicious. Then you guys were having issues. Oh, joys of baking macarons! I went back to my starting point. Yet again. And I’ve learned a few things in the process. There are many reasons why the macarons crack and don’t form feet. For starters, it can be due to under-mixing or over-mixing the batter. Talk about confusing, I know! Let’s break it down a little. When you under-mix the batter, it will still contain too much air, which will burst during baking, creating cracked shells. Over-mixing will result in runny batter; therefore the cookies will spread too much and won’t form feet. To check the consistency of the batter, bring the spatula up and see how the batter falls back. If it forms a ribbon, and spreads slowly into the rest of the batter within 10 seconds, then it’s ready. You can watch a very short video about this process here. The most important thing I learned is the amount of egg whites. I used to just say 2 large egg whites in my previous macaron recipes, which is fine if you’re using store-bought large eggs, because there is an industry standard on how much the egg should weigh in order to be classified as small, medium, or large. But now since my mother-in-law provides me with farm fresh eggs, they are all different sizes and I have no idea whether they’d fall into large or extra large. So, I decided to weigh my egg whites and I realized that I’ve been using too much egg whites for the amount of almond flour/powdered sugar mixture. This is the main reason why I was getting cracked macarons, because my batter had too much moisture than it needed to. So that was a great lesson to learn. 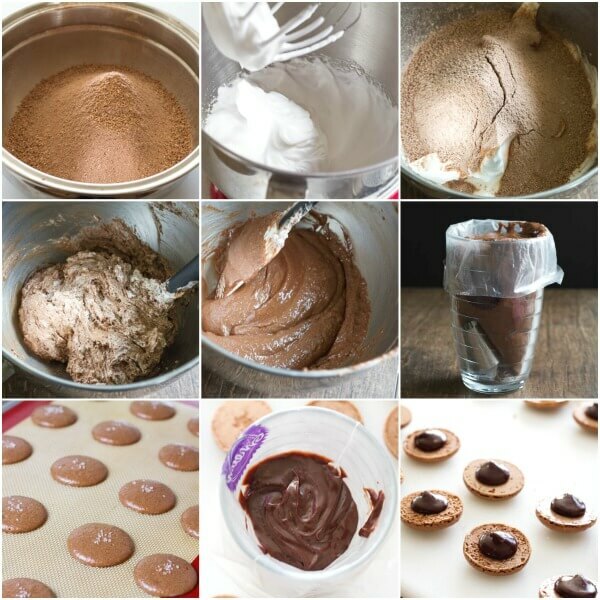 You’ll need to dry the macaron shells before baking to create a thin skin, for 15-30 minutes or even longer. It all depends on how humid it is where you are. That thin layer of skin helps to develop beautiful ruffled feet on the bottom. In a medium bowl, sift together almond flour, powdered sugar and cocoa powder twice. Set aside. In a large mixing bowl with whisk attachment, beat the egg whites on medium speed until foamy. Add cream of tartar and continue to beat. Slowly add sugar one tablespoon at a time. Increase the speed to medium high and beat until hard peaks form. Sift the almond flour mixture over the whipped egg whites. Gently fold the mixture running the spatula clockwise from the bottom, up around the sides and cut the batter in half. The batter will look very thick at first, but it will get thinner as you fold. Be careful not to over mix it though. Every so often test the batter to see if it reached the right consistency. To test the batter, drop a small amount of the batter and count to ten. If the edges of the ribbon are dissolved within ten seconds, then the batter is ready. I repeat, do NOT mix again. If you still see edges, fold the batter couple more times and test again. This step is so crucial, so please make sure to test often to ensure not to over mix the batter. Pipe out 1.5-inch rounds about an inch apart on two baking sheets lined with parchment paper. You should get about 42 shells. Tap the baking sheets firmly on the counter a few times to get rid of any air bubbles. 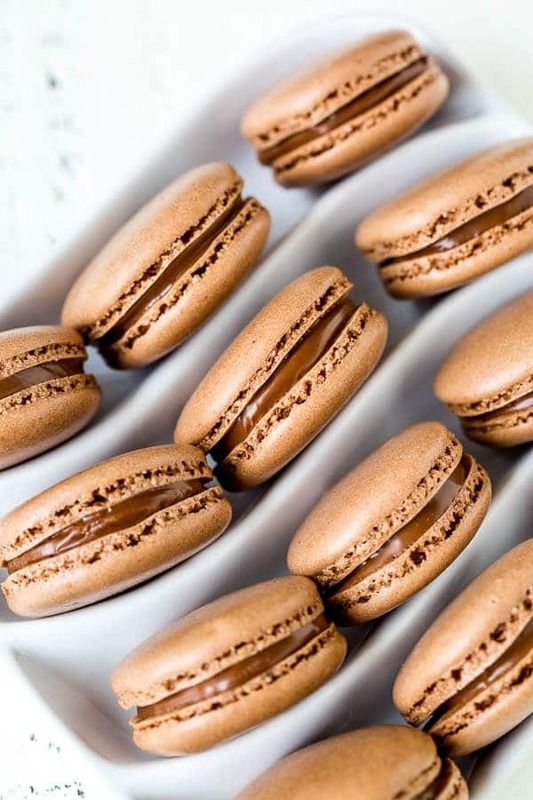 If you don’t release the air bubbles, they will expand during baking and crack the beautiful macarons shells. Let the macarons rest and dry for 15-30 minutes. On a humid day, it might take an hour or so. To see if it’s ready to be baked, lightly touch it. If the batter doesn’t stick to your finger, then it’s ready. Sprinkle a little bit of sea salt on each macaron right before baking. Preheat the oven to 300°F (150°C). 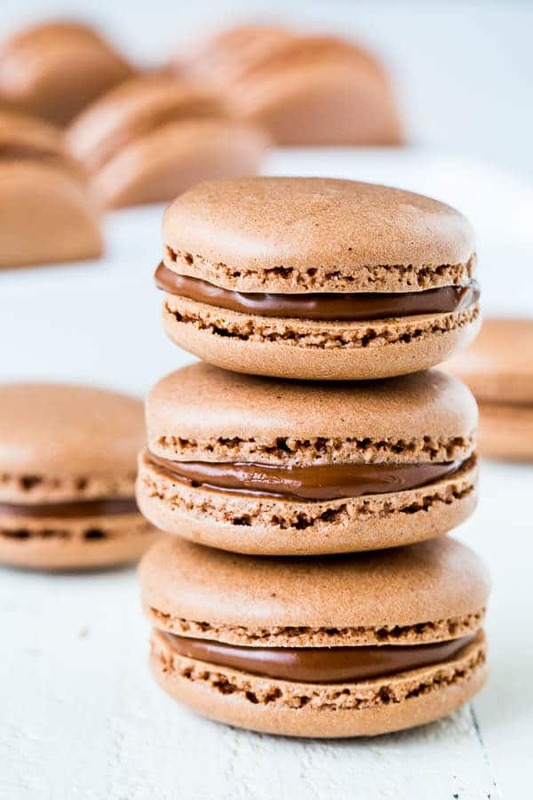 While macarons are cooling, prepare the ganache filling. Heat the heavy cream in the microwave for a minute. In a medium bowl, put the chocolate chips and pour hot cream over the chocolate. Let it stand for a minute or two and then stir until smooth. Stir in Nutella and Kahlua for flavor. Cool the ganache in the fridge to thicken. Transfer the ganache filling into a pastry bag and fill the macarons. This recipe was originally published on November 21st, 2014.